I’m pretty sure everyone who saw the trailer to this film immediately thought of the episode of Curb Your Enthusiasm where Larry David gets stuck on a ski lift with a very, very Jewish lady. This film was like that, but was supposed to be scary. I also always point out, typically to Rampaige, the references to Newbury Comics in Adam Green‘s films. Green grew up in Eastern Massachusetts and always held Newbury Comics, a chain of comic/movie/toy/pop culture stores, near and dear to his heart. Due to his affinity for the store, which I also love, he always includes references to the store, whether it’s the main character in Hatchet wearing one of their shirts, or a giant billboard in Frozen. Moral of the story? Adam Green and I have a lot in common. Things are looking up! Well, by things, I mean all the characters are. Three kids are on a break from college, and two of them being lifelong friends, they go to their favorite ski resort, like old times. Unfortunately, there’s a stupid girlfriend that tags along and whines and complains and periods the whole time. They also don’t buy tickets for the mountain, they just bribe the ski lift operator. With one last possible run, they get onto the ski lift, and through a series of employees going on break, no one realizes they are still on the lift when the park closes. Being stuck in the cold, one of the kids decides he must jump from the lift and crawl to safety. Sadly, he breaks both of his legs, sits there, and eventually wolves come and eat him. The two remaining just hang out and whine and complain, until the other guy climbs the cable of the lift to a ladder, and runs for help. After being there for a little too long, the girlfriend thinks something’s wrong, and attempts to jump herself. Lucky for her, the chair breaks almost completely, and she only jumps about 20 feet, with no broken legs. While travelling down the mountain, she sees that wolves have eaten the other guy, too, and eventually she makes it to the highway, where she is picked up and supposedly lives. I also learned that boys have blue snowboards and girls have pink snowboards. I can get behind the concept of this film, but it’s a little lackluster in its execution. Clearly this film didn’t need to be gory…at all. it might have been worse if Adam Green tried to find ways to make it disgusting. Obviously the scene where the girlfriend gets her hand stuck to the bar of the ski lift was pretty gross, but that was about it. There were some tense moments, but they were few and far between. Each moment being separated by long conversations reminiscing about good times, or sad discussions about what’s going to happen if they are stuck up there forever. It was kind of hard to determine what Green intended to say with this film. That might not be his fault, however, and might have been an issue with the actors not quite conveying the overwhelming dread of oncoming death. And by the way, one of the guys in the movie? PLAYED ICEMAN IN THE X-MEN. CLEARLY ICEMAN CAN’T FREEZE, ADAM GREEN. The girl was the only one to survive. She was also the only one to piss her pants. Connection? I THINK SO! I do have to admit, it was pretty cool to see these people being completely physically vulnerable. Most films involving some sort of snowy disaster relies on lack of communication with the outside world, but at least they are inside. 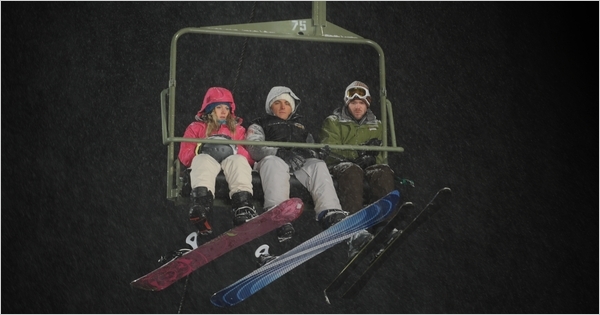 These people could not have been more exposed to the elements than being stuck on a ski lift. Also, by having this take place at a skiing resort, the characters weren’t dying due to Antarctic weather, it was more about impending doom. Sure, they could survive up there for a few days, but eventually, they had to make the choice to either sit there and die, or try to find rescue in any means that they could. The movie was called “Frozen”, but the two characters who die didn’t freeze. They were eaten by wolves. 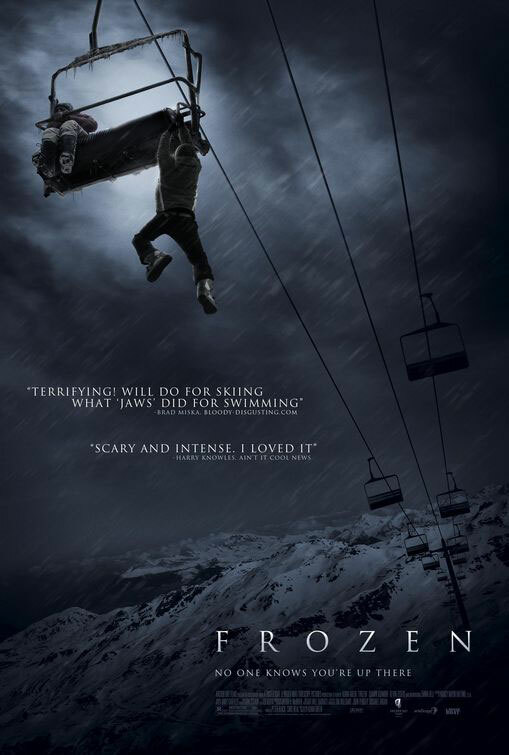 This movie should have been called Wolf-en….WAIT, THAT ALREADY IS A MOVIE! Yackity-shmackity-doooooo!!!! !